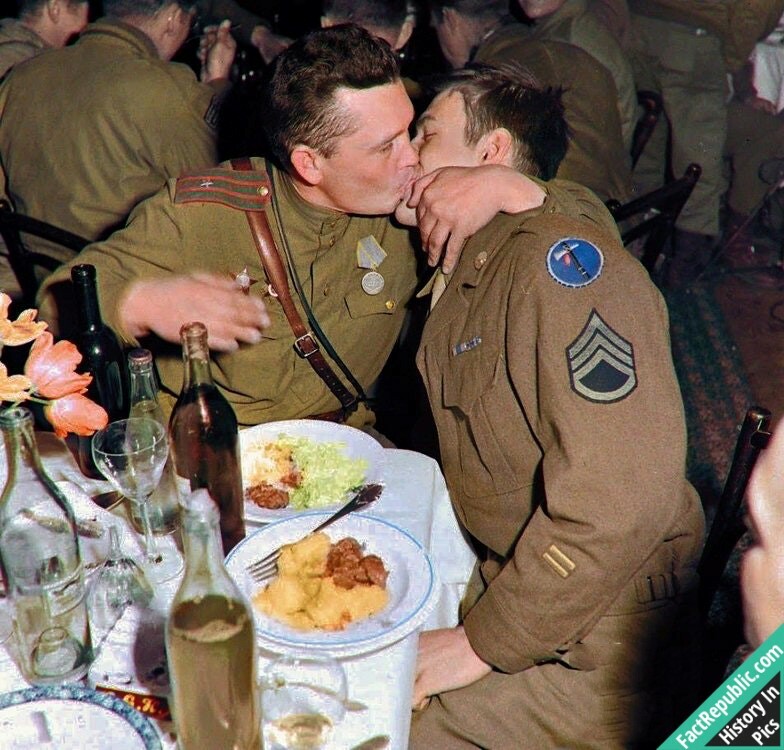 “The Friendship kiss” – Russian and US soldier – Germany 1945. The socialist fraternal kiss or socialist fraternal embrace is a special form of greeting between the statesmen of Communist countries. This act demonstrates the special connection that exists between Socialist states. The socialist fraternal kiss consisted of an embrace, combined with a series of three kisses on alternate cheeks. In rare cases, when the two leaders considered themselves exceptionally close, the kisses were given in the mouth rather than on the cheeks. Most images from war are exclusively of soldiers fighting, or dead bodies, or all other awful things. But for the most part, they seem to exist in some sort of a bubble. Just like the rest of us, this guy would rather be playing with a cute little kitten. The cat in this picture is a reminder that soldiers in war are real people with real experiences. 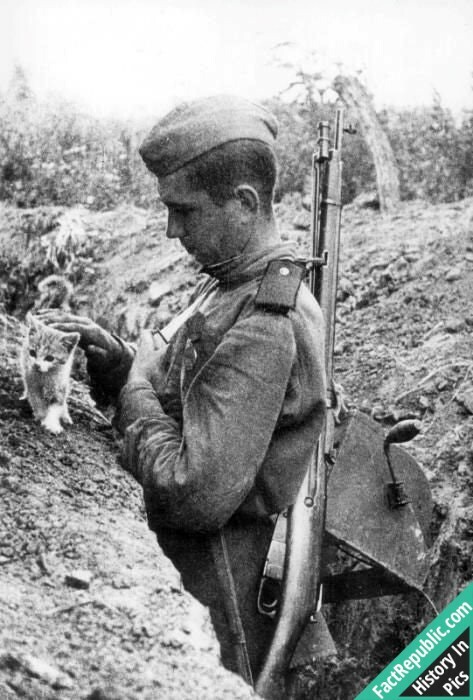 WWII didn’t occur in some alternate universe, it was fought in the same universe that has kittens, puppies, flowers and all the good stuff. It’s a sobering reminder. Earliest known photo of Elvis Presley, with parents Gladys and Vernon in 1938. There is no date or location for this photo, but you can see a concrete wall behind them. Vernon was arrested after he forged a $4 check in November of 1937 and spent 6 months in the Lee County Jail awaiting trial. This photo was likely taken after he was sentenced to 3 years in prison in May of 1938 when Elvis was 3 years old. Elvis had a twin, Jesse Garon Presley, who died in childbirth. Elvis legally changed his middle name from Aaron to Aron so that it would be closer to his twin’s name. German World War 1 veteran begs on the streets of Berlin, Germany 1923. The Weimar Republic wanted to distance itself so radically from traditional authorities and the monarchy that, while paying disability benefits to Veterans, it largely refused to acknowledge their service and their sacrifices publicly. In Germany, the creation of a central memorial to WW1 veterans was not possible while just a few years after the war one would have been hard-pressed to find a village without one in France. Jeremy Corbyn at an anti-Apartheid protest in London, 1984. The Conservatives in power at the time banned protests in front of the South African embassy. Corbyn and many others did it anyway, even when he was a member of parliament back then still. Jeremy Corbyn was arrested for protesting against apartheid. In the 80’s pretty much everyone in the UK was protesting against it. There were lots of concerts in England, designed to spread the cause of ending apartheid. There was even a sort of cultural boycott of South Africa, just so the South African government wouldn’t profit from music sales in any way (Paul Simon broke this agreement with his album Graceland). The UK was very reluctant to condemn Apartheid in the 60’s but by the 80’s, it was a foregone conclusion that South Africa would be forced to end it because of how isolated they had become. By 1984 even the UN itself had condemned it. David Cameron went on a trip to South Africa in the late 1980s (after Mandela had been imprisoned) with other young Conservatives. It was put on by a PR firm who was trying to stop the sanctions and to prop up Apartheid. This was around the time that his party’s leader (Margaret Thatcher) was still calling Mandela a terrorist. South Africa was banned from a lot of sports and other countries faced sanctions from international bodies if they played versus South Africa. It really brought apartheid to the forefront of public consciousness. International social movements against apartheid put pressure on governments like the UK who were happy to continue working with the awful regime as long as people were ignorant about it. By bringing the horrors to the forefront of public consciousness, Western governments which were nominally committed to ideas of democracy and equality had to put pressure/stop dealing with the regime which severely weakened the apartheid state.